Maiduguri - Niger is increasingly becoming a target for Boko Haram attacks, as the Islamists come under sustained military pressure in Nigeria while reeling under a leadership struggle, analysts said Thursday. Despite a decline in the frequency of attacks this year in northeastern Nigeria, the experts warned of escalating raids across the border, especially in Niger. "Niger's southern border with Nigeria represents a relatively soft flank for Boko Haram, particularly in its eastern stretches," Roddy Barclay, intelligence analyst at consultancy firm Africa Practice, told AFP. "The porous national border is under-policed and adjoins some of the most insecure territories in northeastern Nigeria." 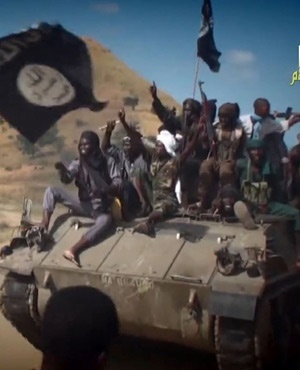 IHS Jane's Terrorism and Insurgency Centre (JTIC) said Boko Haram carried out 22 attacks into Cameroon, Chad and Niger in 2014 and 62 in 2015, when it aligned with the Islamic State group. There were 41 cross-border attacks this year until the end of August with Niger bearing the brunt of the violence, including a raid on a military base near the southeastern town of Bosso in June in which at least 26 soldiers were killed. "Before Boko Haram allied with the Islamic State, it did carry out cross-border attacks outside their core territory of north eastern Nigeria," said Matthew Henman, head of IHS JTIC. "But since 2015, the number of cross-border operations rose dramatically as the group retaliated against the West African coalition fighting to defeat them." Henman said the Bosso attack - and subsequent strikes against government and other military targets in the region - indicated a shift in Boko Haram to ISIS methods. This focused "less on the indiscriminate killing of fellow Muslims and more on targeting regional security forces". IS announced in August that Abu Musab al-Barnawi - the son of Boko Haram's founder Mohammed Yusuf - had replaced Abubakar Shekau as head of the group, which now styles itself Islamic State West Africa Province (ISWAP). Barnawi has criticised Shekau for the indiscriminate killing of fellow Muslims: at least 20 000 people have been killed in northeast Nigeria in a wave of raids, suicide attacks and bombings since 2009. The shadowy Shekau has maintained he is still in charge but there have been recent reports of clashes between rival factions in the north of northeast Nigeria's Borno state, near Lake Chad. JTIC said it still expected attacks on civilians from the Shekau camp to continue, while those aligned with Barnawi would conduct operations against the military and government. The upsurge in attacks in Niger was an indication Boko Haram may have already begun to regroup, contradicting the military's version that it was on the run and struggling, Henman told AFP. He also said the jihadists' aim appeared to be to undermine the Multi-National Joint Task Force of Nigeria, Cameroon, Chad, Niger and Benin, which is operating in the Lake Chad region against them. The regional force, whose deployment has been long delayed, depends on coordination and cooperation between countries not known for working together or sharing mutual trust - and Boko Haram could play on that, said Henman. "ISIS has been very good at picking apart alliances and coalitions, pitting allies against one another. They will try to sow discord in that coalition," Henman said. Nigeria is facing security threats on multiple fronts: Boko Haram in the northeast; ethnic violence in the central region; Biafran separatists in the southeast; and oil rebels in the south. "The military build-up (in northeast Nigeria) can't be sustained indefinitely", even if the threat in the Niger delta does not develop, he added. While Nigeria boasts one of the largest armies in Africa, Barclay warned that fighting multiple fronts could expose political mismanagement and corruption in the military and undermine recent gains. "The military technically has the resources to operate on two fronts," Barclay said. "But it risks becoming stretched and seeing some of its internal dysfunction exposed," he said. "Any shortfalls in discipline, management and logistics are likely to be accentuated."